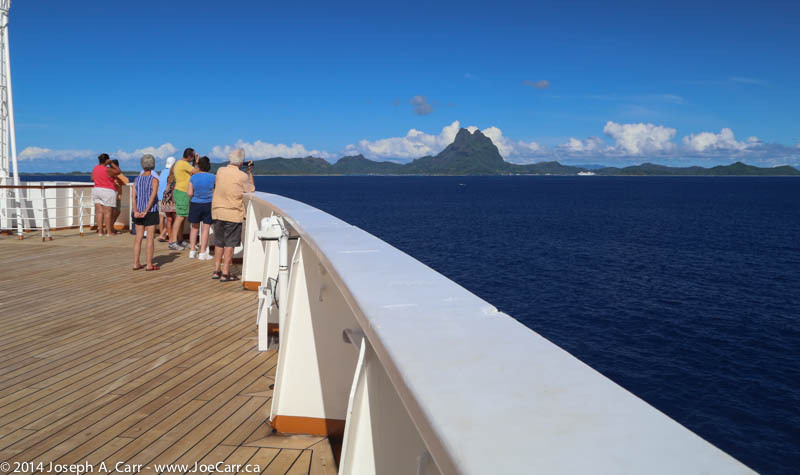 Since we crossed the International Dateline again, we get to live February 28th for a second time today, a day at sea enroute to Bora Bora. So I’m calling today February 28B, and yesterday was February 28A. We also crossed the Equator last night, so we are now officially in the Southern Hemisphere and the South Pacific Ocean. I go to the coffee chat interview that the Cruise Director Armen does each morning in the Crow’s Nest Lounge, because he is interviewing Emile and Marie-Claude, the duo of Band Artistique, the act I saw two nights ago in the Showroom. They reveal they have their two pre-school children with them onboard, and will be performing next in Germany for a few months. I meet a couple who ran into the Jones Act issue as I did on the Big Island of Hawaii. They had planned to stay with friends overnight on the Big Island, but like me, they decided not to risk the wrath of the US Immigration coming down on them in future. They did not stay overnight with their friends, but just visited them when we pulled into Kailua-Kona. I watch my first movie while aboard ship this afternoon. 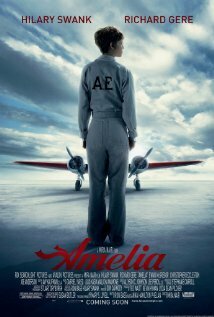 Amelia is a biographical account of Amelia Earhart’s adventures and eventual attempt at flying around the world. She and her navigator were eventually lost over the part of the Pacific Ocean we are currently sailing through. She was attempting to land on Howland Island, but never made it. Hilary Swank and Richard Gere were the two stars playing Amelia Earhart and her husband/publisher George Putman (respectively). Not a bad movie, from someone like me who rarely watches movies. Our second day at sea is routine, however the weather is certainly warming up. The temperature at noon is 30℃, but the humidity is down to 66%. It is mostly sunny, with some clouds in the sky. The deck chairs are full of people tanning this morning. I walk a couple of circuits around the Promenade Deck, but otherwise stay inside where it is cooler. I take a tech class this morning on the Windows App Store. It certainly has come a long way from when it started, and offers a serious alternative to the Apple App Store for Mac. There is always something to learn while aboard cruise ships. I sit in the library and finish reading a book on my iPad that is 611 pages long! It is time once again to do some laundry before the busy days in French Polynesia, so I throw a load into the self serve laundry located on my floor at lunchtime. There are only two washers and two dryers on my floor, so it is always busy. It is $2 to wash and $1 to dry, so for $3 I can have as many fresh clothes as would cost $20 to have done by the ship’s laundry service. The captain reports we passed within 6 nmi of Starbuck Island at 1AM this morning, so we are in a very remote part of the South Pacific right now. As of noon today, we are still some 500 nmi from our destination of Bora Bora, so at 18 kts we still have about 28 hours of travel time. The schedule calls for us to arrive at 4PM tomorrow. The captain feels we should meet that goal if the winds continue to cooperate. There is a tropical rainstorm this afternoon. It looks grey and wet outside through the windows. New to this cruise are art exhibitions and auctions, which are held during the day in the Ocean Bar. 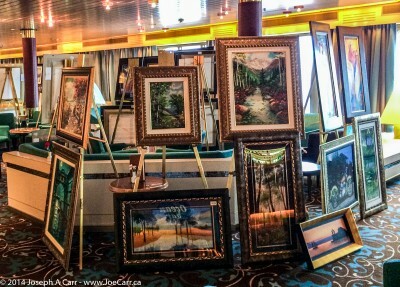 I can’t image lugging paintings home aboard an aircraft, but obviously they must do pretty well at selling aboard ship. The ship’s crew set it up for them and tear it down a few hours later, and store all the paintings, restoring the bar area for general use after the art auction is over. It is formal night this evening, so after having a nap in my cabin, I get dressed in my dark navy jacket, black pants, shirt and tie. Dinner in the Rotterdam Dining Room is very pleasant, since I am seated with a couple at a table for four. There are only three of us, so it is easy to talk. Like most of the passengers aboard, they have cruised extensively. In fact, they did this particular cruise just last year! Probably the most interesting cruise they mention during our conversation is a repositioning cruise from Singapore to Amsterdam, with stops in India, the Seychelles, around the Cape of Good Hope, and then northward. They said the ship was only about half full, so there was lots of service from the staff, and they got to know both the staff and passengers well. This interests me, since I had planned to take a simlar cruise but in reverse – Europe to SE Asia through the Suez Canal. Essentially, this is a day at sea, however we arrive as scheduled at Bora Bora this afternoon at 5PM. The seas this morning are much reduced, the grey skies are gone, and things are looking decidedly tropical outside. As we pass through the channel into Vaitape harbour, there is another cruise ship anchored: the Artania, registered in Hamilton, Bermuda. The island and the volcanic mountain are as I remember them, but I can’t quite place where the airport is located. I’m assuming it is to the east of us, further down the lagoon. The ship clears immigration by 5:30PM, and there are already 200 people waiting to go ashore on the tenders. I’m in no rush to go ashore this evening, but perhaps I will go after I have dinner in the Rotterdam dining room. There is a Polynesian BBQ and buffet on the Lido deck, which I will avoid! After dinner, I decide to stay on board the ship, and simply enjoy the views of this tropical paradise from the ship’s decks. This entry was posted in Pacific Ocean and tagged auction, comedy, cruise, Equator, harbor, harbour, International Date Line, lagoon, movie, paintings, rainstorm, ship. Bookmark the permalink.